Sony is about to roll out a couple of new features for its iOS Music Unlimited app, including offline playback and high-quality audio. It’s also slashing its subscriptions rates for a limited time as it seeks to attract new users in the increasingly crowded music streaming space. Offline playback, a feature already available to Android users of Sony’s subscription-only music streaming service, does what it says on the tin, allowing you to download albums, songs and playlists to an iOS device for convenient listening when no Wi-Fi connection is available, or if you simply want to conserve battery life or cut down on data usage. An offline listening mode is already available with similar services such as Spotify and Rdio. Version 1.3 of Music Unlimited, which Sony says is set to go live in the iTunes app store “very soon” (in other words, your guess is as good as theirs as to precisely when it will make it through Apple’s rigorous inspection procedures), will also give users the ability to listen to tracks in high-quality 320 kbps AAC streaming audio. However, there is a limitation – this particular feature can’t be utilized in the new offline mode, so you’ll have to be connected to make use of it. The Japanese electronics and entertainment giant is also looking to pick up a few new users for its ad-free music streaming service, offering special rates to new subscribers for a limited time. PlayStation Plus members can pick up a 12-month premium subscription for $42, around 65 percent off the regular rate. Those without a PlayStation Plus membership will need to fork out $60 for the same subscription, but that’s still 50 percent off the usual price. Spotify, by contrast, offers the premium version of its service for $120 a year (Music Unlimited’s usual rate). Both services offer somewhere in the region of 20 million tracks. 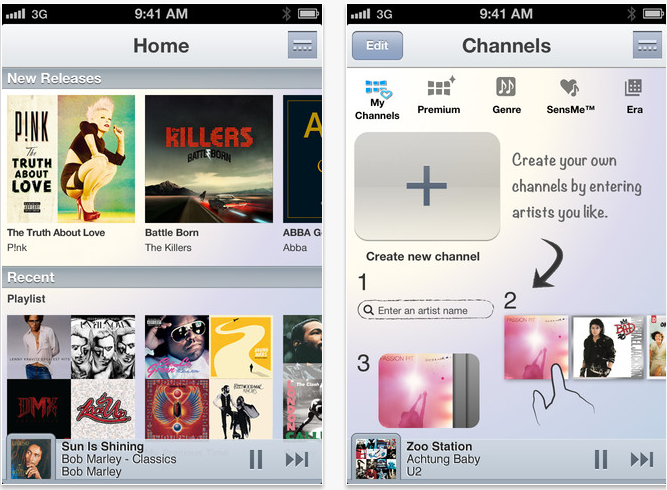 Version 3 of Music Unlimited will appear here when Apple gives it the green light. Existing users will be notified via their iPhone or iPod Touch when the update hits the app store.